For any technology journalist deeply embedded an analytical content, knowing your field is a key element to how you work. If all the focus goes into the high-end, it is easy to get complacent, or living in a technology hub can feel like a bubble. 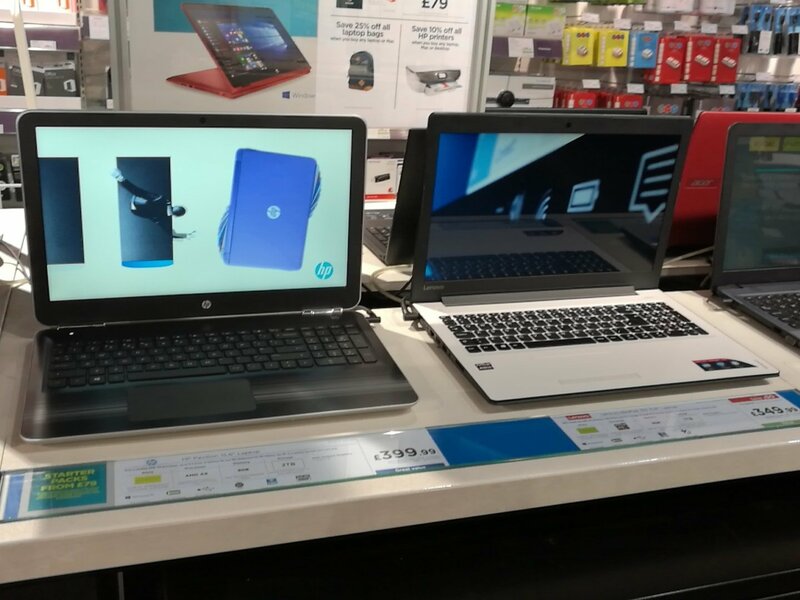 This is why several times a year I wander through the local Brick and Mortar retailer to see what is on offer to users that simply walk in off the street to buy a tablet, notebook, or a casual £99 Bluetooth speaker purchase, as what happened this week. 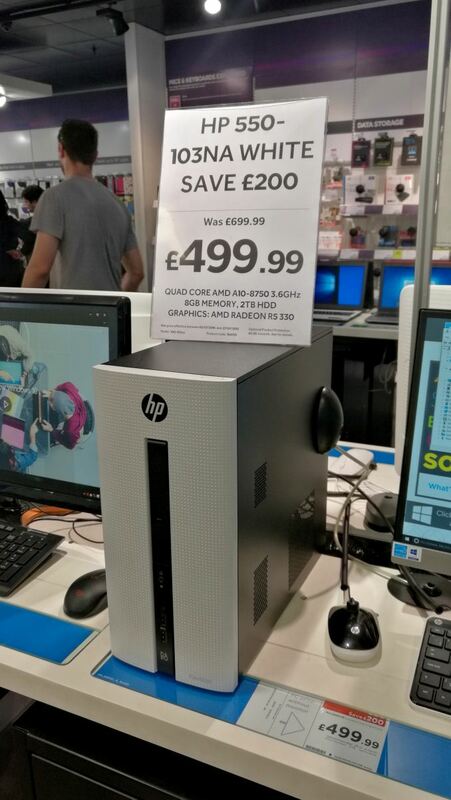 I'm in the UK, so our sole brick and mortar option is typically PCWorld, however it emulates Best Buy in a number of ways. 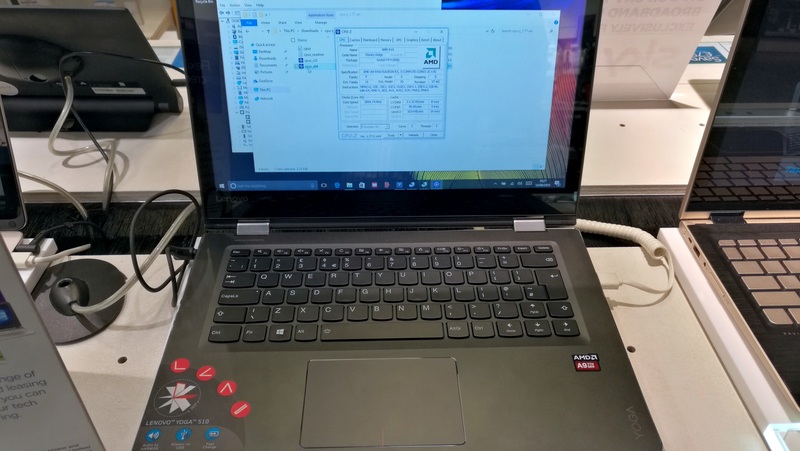 Looking through the arrays of notebooks and laptops on offer, prior to my recent visit this week, it was very clear that pickings for AMD processors were very thin. 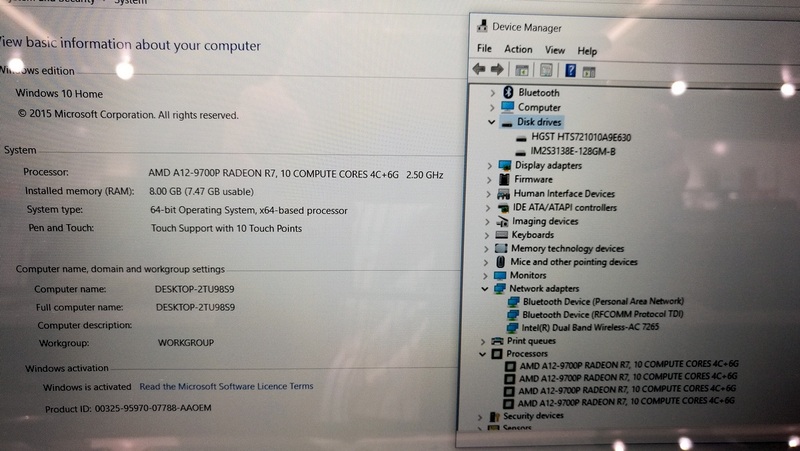 Since the demise of netbooks, and Intel's Ultrabook strategy, almost all AMD offerings on shelves were restricted to a single unit, or under 1 in 20 on the show floor, and typically a budget device with low-quality displays, track pads, and build quality. Part of this, as I learned when a sales executive took me through a Best Buy in the US, is due to marketing in the store itself. Companies can invest in aisles all to themselves at a retailer at select stores or nationwide, or if there is an overriding feature that several companies share, they can invest in an aisle together under the feature heading. Aside from the aisles, there are end caps, pre-fabricated displays, video walls, and all manner of possibilities. Some users will be familiar with store-in-store elements from Samsung or Apple, where they pay for dedicated floorspace and dedicated salesmen to be trained in solely their product. Closer to the front door of the store costs more, too. Due to the way that these brick and mortar locations sell their internal space, those with big marketing budgets have an advantage, as well as investment from OEMs (like Intel, HP) as a bonus for large volume component purchases. It ends up being a sizeable investment to in-store sales, and more eyeballs end up on potential halo products like an Omen, an Alienware or a Zenbook. There's also an added factor, albeit anecdotal, that it might be common for sales staff to not suggest brands that have been commonly associated with low-performance in the past. Understandably, AMD has a roughshod time at this. Due to their well-documented size and budgets, being able to assist their major partners in store-focused placement is fairly difficult. Their major partners are HP and Lenovo, so with that in mind those budgets may be very region focused for some hardware configurations for sure. It's also difficult to train store staff in the hardware without investing in the shop floor as well, unless they already have a sizeable interest in the specific market. Despite that 1 in 20 figure, which has been generous in most cases (including the Best Buy right near AMD's Austin office, or the Fry's in Sunnyvale), smaller retailers that go after the second-hand market seem to have had a better ratio than that. Speaking to a few of these retailers on Tottenham Road in London, the £200 second hand AMD APU-based notebooks get a sizeable interest from students on a shoestring budget, if only for mild gaming and LAN gaming (using pen and paper is still fairly common in UK universities in lectures, apparently). These retailers tend to sell a number of low-end devices, such as Pentium, i3, A6 and A8-based with HD/900p TN panels, which might not be a sizeable representation when we normally discuss new sales, but indicates that a number of users are still cost-driven in that price range. So Why This News Post, What's Changed? Typically a tech journalist's week has a few meetings, perhaps a prebrief or two, and it just so happened that a VP for an unrelated company was in London, we met nearby and we talked shop. On the way out, I ran some errands and spent some time in PCWorld. I wasn't expecting to see much - it's a small store with Apple in the front and TVs in the rear, and the selection they tend to have across their 20-30 notebooks is barely mid-range, with one or two exceptions. So expect my surprise when I found five AMD notebooks in that set, with one out of the three desktops on show being the OEM version of the A10-7860K. These weren't old systems either - four of the notebooks where the new AMD 7th Generation APU (two Bristol Ridge, two Stoney Ridge), with one being 6th Gen (Carrizo-L). 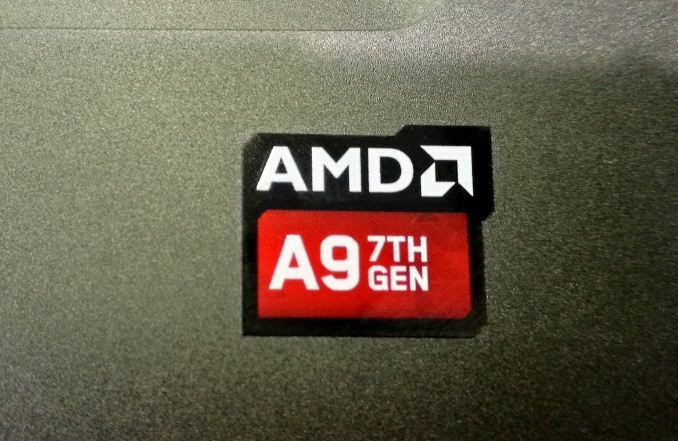 The first one that popped out near the front of the shop was the Stoney Ridge device, spotting a large 'AMD 7th Gen' sticker. This was a Lenovo Yoga 510, with a touchscreen and 360-degree hinge, being marketed as a 2-in-1. Under the hood was an A9-9410, which is a single module 25W AMD APU using 2nd Generation Excavator modules, with a 2.9 GHz base and 3.5 GHz turbo. It has 192 streaming processors at a base 800 Mhz (more when there's headroom), but because it is Stoney Ridge there's only access to single channel memory. At least Lenovo paired it with 8GB of DDR4-2133, which is eminently better than a 4GB option. The 14-inch 1366x768 TN panel from AUO was dire, even from a minute or two with bad viewing angles, and storage came via a 1TB Western Digital mechanical drive. WiFi was at least 802.11ac, albeit 1x1 from the QCA9377 controller. CPU-Z showed that the silicon was the ST-A0 stepping, which suggests that AMD did a relatively good job during tapeout. 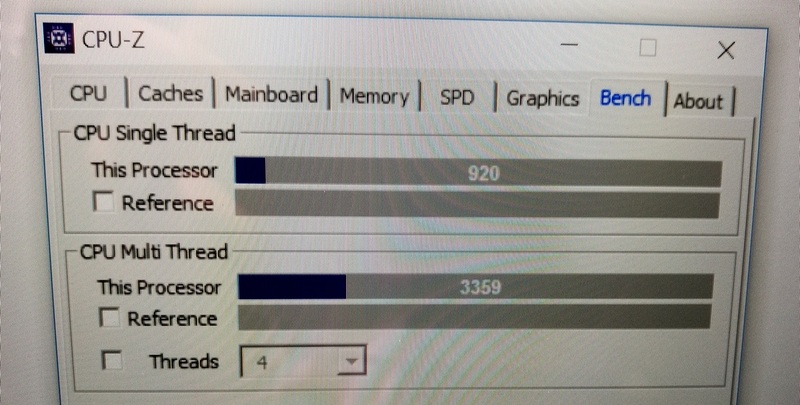 Unfortunately CPU-Z 1.77 doesn't seem fully geared for * Ridge laptops (a point worth noting later), but the benchmark gave 987 for single thread and 1741 in multithread. 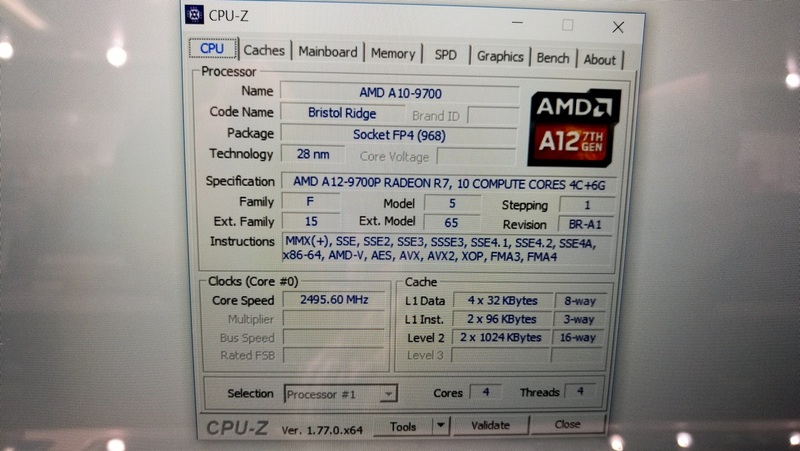 Not having used the CPU-Z benchmark seriously before (and there not being that much a store will let you run with free will), but a cursory glance online puts the FX-6300 at 1152, and a stock i7 920 gets a score of 998 for single threaded performance. Interestingly I had originally walked past this. All the AMD official logos had been removed from the keyboard and specification list beside the notebook, which struck me as a little odd. HP is arguably AMD's biggest partner for notebooks, with the Envy and Omen being two of the most premium devices for Bristol Ridge that have been announced. Part of me might suspect this is for a reason, or it could just be a case of Hanlon's Razor and someone forgot/they weren't ready. 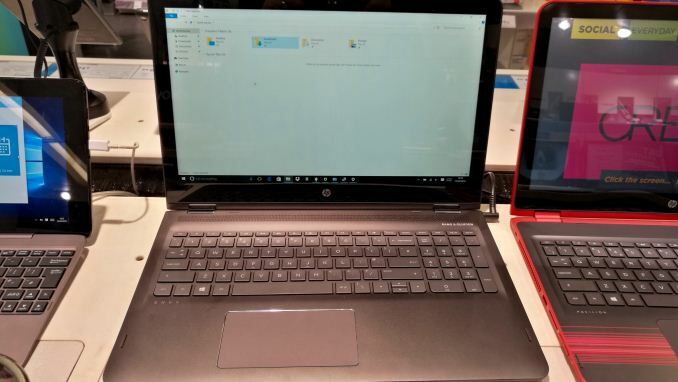 The Envy was the most expensive AMD notebook on display, offering a typical HP premium design ID with a near-top line A12-9700P under the hood. This uses two 2nd Gen Excavator modules for four threads, a configuration called Bristol Ridge, and runs at 2.5 GHz base with 3.4 GHz turbo on the cores. The A12 ensures the 'R7' name on the integrated GPU, but this has 384 SPs (6 CUs) rather than the full compliment, and it runs at 758 MHz for a total of 15W TDP on the processor. HP paired the SoC with 8GB of DDR4 memory, although we were unable to determine if this was single channel (1x8GB) or dual channel (2x4GB) as CPU-Z is not currently configured for 7th Gen detection. The system has two drives - a 128GB SSD from an unknown vendor as a boot drive and a 1TB mechanical storage drive from HGST. The panel was a clear 1080p IPS, and the track pad was certainly larger than I had expected. Internal Wi-Fi is a 2x2 solution using Intel's 802.11ac 7265 controller. One thing worth noting is that this was the only system with a Type-C connector. This is USB, and based on the logo seems to be a USB 2.0 implementation. In the more budget section of the store were two systems, but I essentially passed over this design from HP. It uses an A9, implying Stoney Ridge and 1x8 GB of single channel DDR4-2133. This came with a 2TB mechanical drive, and looks very similar to previous HP Pavilion systems. Further to the other HP system, this was also devoid of any AMD logos. However the Ideapad 310 intrigued me. It was the cheapest model on display, cheaper than both the Stoney Bridge models, but came with a 15W Bristol Ridge A10-9600P, a dual module/quad thread design running at 2.4 GHz/3.3 GHz. 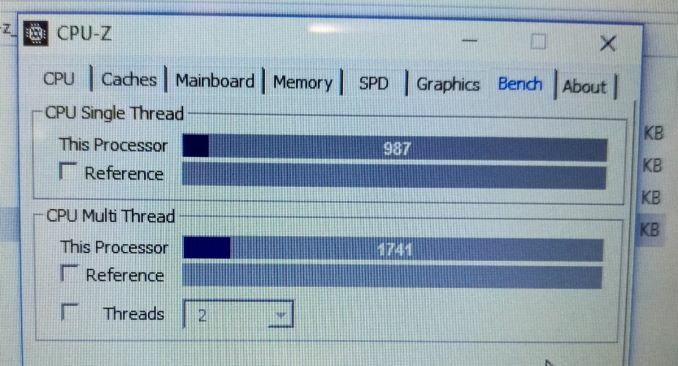 The APU has support for dual channel DDR4-1866, and I'd half expect this 8GB model only had one memory module, but the rear of the device had a large enough section for users to add in their own memory. The APU also has a 384 SPs (6 CU) design for graphics, running at 720 MHz. Other specifications include an Intel 802.11ac module, an integrated DVD drive, a 1080p screen (unfortunately TN) and a 1TB mechanical SATA storage drive for £350. There have been instances in the past where an OEM uses a bargain basement design, but sticks in the high-end processor (Like the 9800) as a big 'wow' factor, but the cooling and the build quality gives the game away after a few days of use. Nonetheless, part of me feels that another $20 on an IPS panel would actually provide a good experience, as long as the design supports dual channel memory. If that's the case, I'd stick in 32gb of what I have lying around, a spare 1TB SSD, and it would be a nicely workable system for Anandtech on the road. Maybe that's just me. When AMD launched the Kaveri Refresh line of processors, sometimes known as Godavari, alongside the number of consumer-focused processors was a line of OEM-only parts. The consumer line was the 7000 series, whereas the OEM line was the 8000 series, but fundamentally it was the same silicon and same set of specifications, except the OEM-only parts were designed for the HPs, Dells, Lenovos and other system integrators with different support packages therein. For the UK at least, these tend to be online only purchases, at least anecdotally from my experience any AMD desktop in a brick and mortar store tends to be AMD FX based on the AM3+ platform. 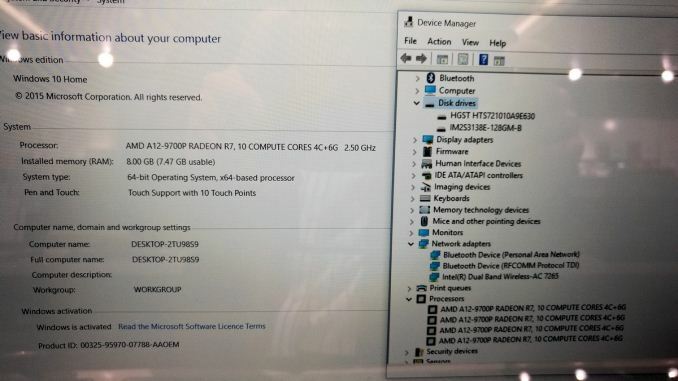 So I was quite surprised to see an AMD Kaveri Refresh system in a HP desktop with a reasonable design ID. The system on display used the 65W A10-8750, the OEM equivalent of the A10-7860K, combined with an R5 330 discrete graphics card as a dual graphics solution (512 SPs at from the APU, 320 SPs from the discrete card). It's a slightly lopsided configuration, aimed mainly at supporting multiple screens or different connection types. The system had 8 GB of DRAM, and I was able to barely see into the case to confirm it was in two memory modules for dual channel operation. Storage on the system was marketed as a 2TB drive, however the system did have a 128GB SSD as a boot drive as well. 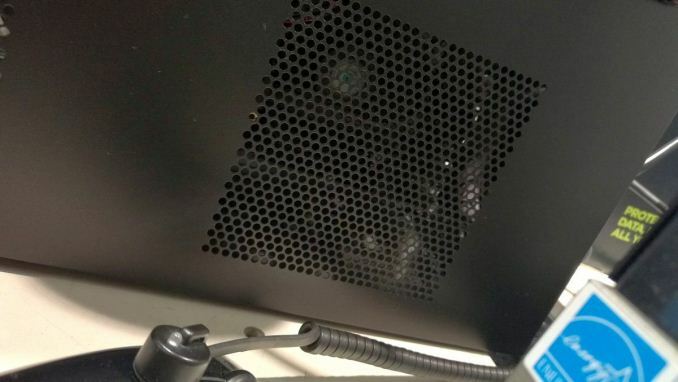 Interestingly while looking through the side vents in the system, I noticed that the motherboard had been put in upside down but also reversed, similar to the Corsair 600Q that we recently reviewed. There are many reasons for this, and I asked if we could open the case up so I could see inside. Unfortunately after asking the floor manager, I was told that opening the case would break the warranty, so I wasn't able to get a better look in the internals, but it was certainly interesting to see these OEM systems on the shop floor. 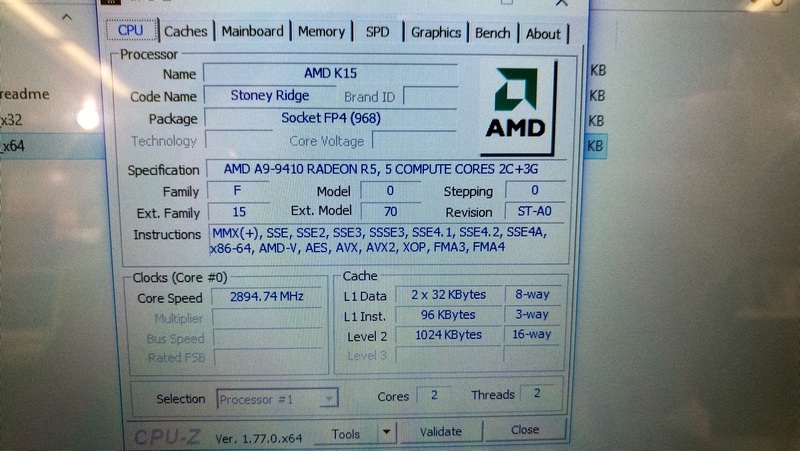 So You Saw Some AMD Systems, So What? As a pure observation, the fact that my singular trip showed a greater proportion of AMD designs available for eyeballs on a shop floor is an anecdotal indicator that AMD's OEMs are being bolder and/or more confident with their AMD designs. Sure, none of the ones I saw were absolute stunner systems, with a peak value of 650GBP ($717 pre-tax) and none in a real ultrabook/XPS13 style, but the numbers and variety shows a marked change in what a consumer can see when they visit a store. I spoke with the store rep who shadowed me during my visit, and I asked whether people were actively interested in any AMD systems. He replied that there was no specific interest, unless gaming was an aspect. 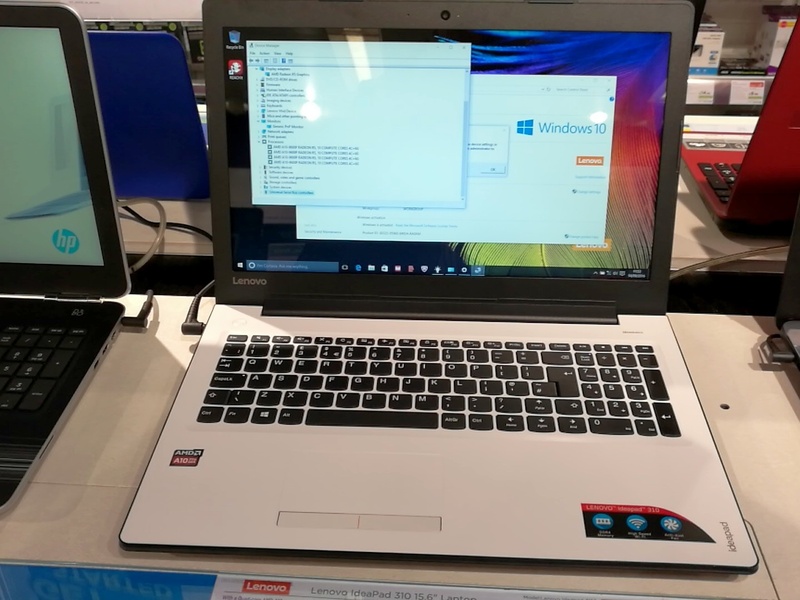 It's worth noting that the PCWorld didn't have any of the usual MSI/Acer gaming notebooks on display, so the best gaming laptops on show would have been the products using AMD APUs. It sounded as if the only reason a laptop with an AMD APU would be actively promoted if the customer specifically said gaming was a priority. It's an interesting take, and one that AMD would gladly take. The store rep picked my brain a bit about the state of the industry, and what we might expect in the future. I recanted what we've learned over the last few weeks about Kaby Lake and Zen, as well as a little bit of VR discussion. Compared to some previous store reps I've spoken with, even though he wasn't up to speed with the absolute latest, he certainly knew about specific processors, graphics cards and general perceptions of the big OEM players in that space. Kudos to Raj, it was a fun half hour! With regards Zen notebooks in the future, Lisa Su mentioned during an August presentation that after the launch of the high-end desktop parts and AMD in servers, notebooks are expected in the second half of 2017, or essentially 12 months away. I suspect during Computex and/or IFA next year, we might start to see some interesting Zen designs for notebooks. 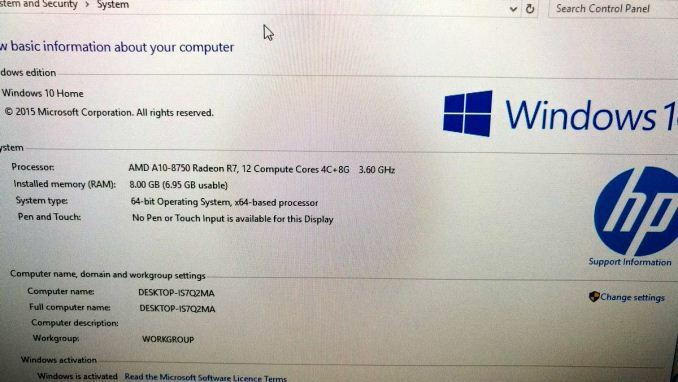 Kinda wish they would do 8 cores Zen+discrete in workstation laptop and maybe gaming.